I had an interesting issue to debug which resulted in a race condition where the finalizer was being called while the object was still in use. 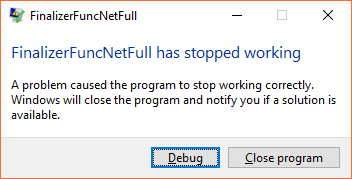 If you know how .NET works this should ring some alarm bells since this should never happen. The finalizer is expected to run only when no one has a reference to the finalizable object anymore. A simple reproducer is below. It creates 50K finalizable objects. Each object allocates 500 bytes of unmanaged memory which is released either by calling dispose on it on a dedicated thread or the finalizer thread will kill the rest during application shutdown. Ups that should not happen. 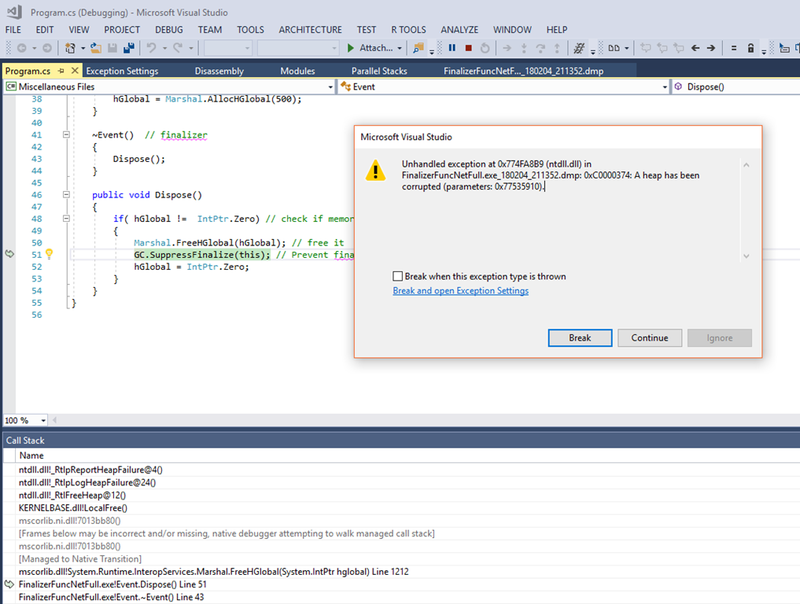 When trying to run the application under the VS debugger everything works on my machine™. No matter how hard I try it will never crash under the debugger. But if I start it without debugging it will crash every time. 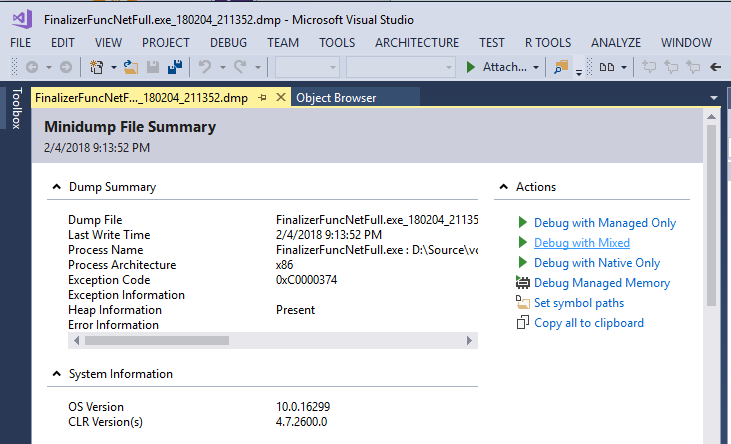 Because part of the issue has to do with the .NET Runtime we need managed and unmanaged debugging. It is therefore wise to enable Native and Managed debugging. So what is the problem here? Could it be that the finalizer is disposing the same instance on which our TPL thread is still working? 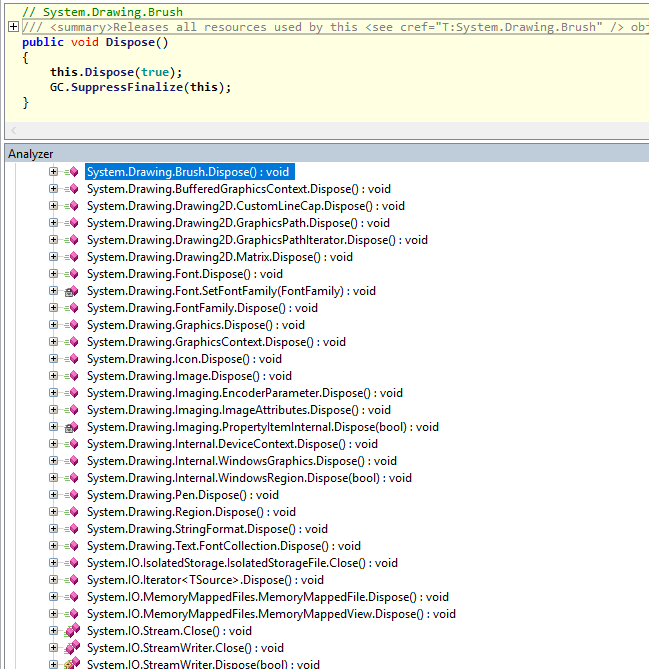 A concurrent double free sounds likely but by only using Visual Studio we cannot prove it. If a finalizer is called while we the object is still alive we would have found have a pretty serious GC bug. On the other hand if that would be the case many people would have complained. [21:13:52] Dump 1 writing: Estimated dump file size is 83 MB. procdump is a command line tool to take memory dumps in many ways. This time we take a full memory dump -ma for unhandled exceptions -e where we execute a process -x and put the dump to the current directory . followed by the executable and optional command line arguments for the executable. The most difficult part is that I always forget that the first parameter after -x is not the executable and its arguments but the dump folder. If you try to capture a dump on first chance exceptions before it becomes unhandled you normally use -e 1 but for reasons not known to me this did never trigger the creation of a dump file. If all fails you can still take a memory dump while the “… has stopped working” dialog is shown with procdump for a given pid like “procdump -ma pid”. It is working on VS 2013, 2015 or 2017 15.6 (still beta). 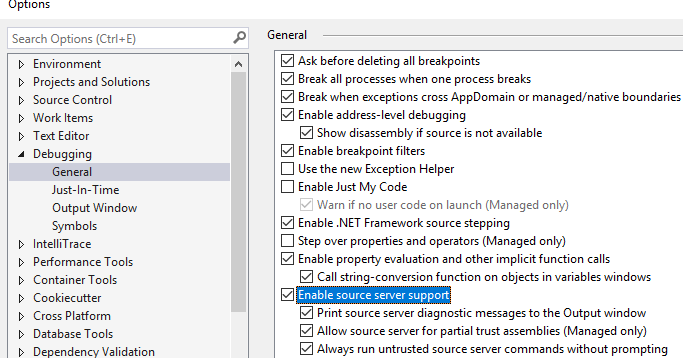 As workaround you can copy srcsrv.dll from an earlier VS edition to the VS2017 one to get source server support back again. from where you can download the Windows SDK installer. 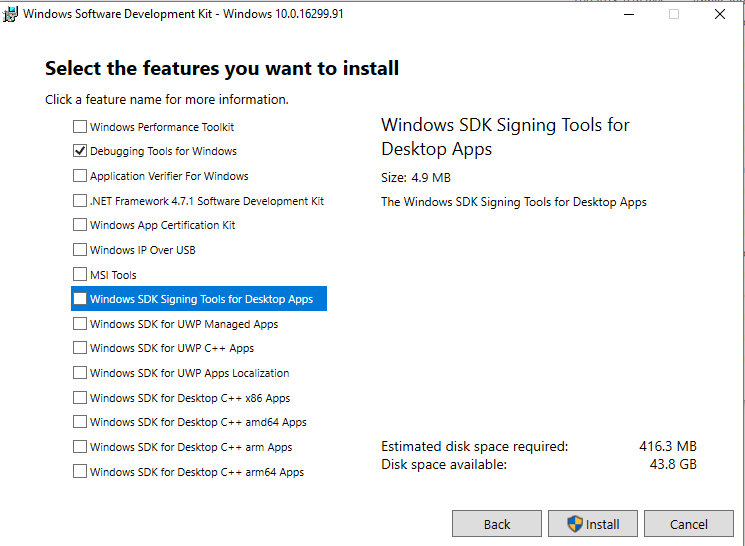 If the installer wont start you have a newer version of the Win 10 SDK already installed. 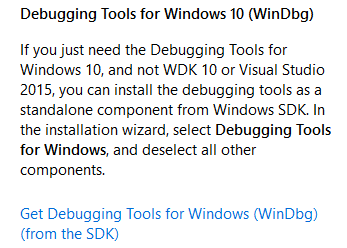 In that case you can download the latest SDK installer from https://developer.microsoft.com/en-us/windows/downloads/windows-10-sdk. When you start the installer you need to press next a few times to get to the list of features you want to install. 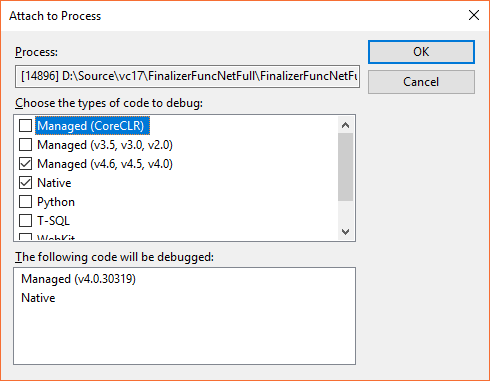 Check Debugging Tools for Windows and press Install. 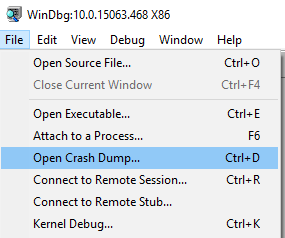 Start the correct Windbg version (x86,x64) and load the crash dump file. Please check your debugger configuration and/or network access. then you did load the wrong Windbg because you did open a 32 bit dump with the 64 bit version of Windbg. Things get easier with the upcoming new Windbg which is in Beta where is only one debugger which will load the right debugger. If you dare to use ” for the path then you need to adhere to the C style escape rules where you need to use \\ to get a \. If you analyze a memory dump on another machine with a different .NET Framework version installed some of the SOS commands might not work or sos.dll refuses to be loaded. In that case you can check out my OneDrive folder https://1drv.ms/f/s!AhcFq7XO98yJgoMwuPd7LNioVKAp_A which contains a pretty up to date list of nearly all .NET Framework sos dlls. You need to extend the symbol path to the downloaded sos dlls (.sympath+ c:\mscordackwksDownloadDir) and then load it via the full path. Things become easier in the future if Windbg automatically loads the right sos.dll from the symbol server which seems now to be in place. 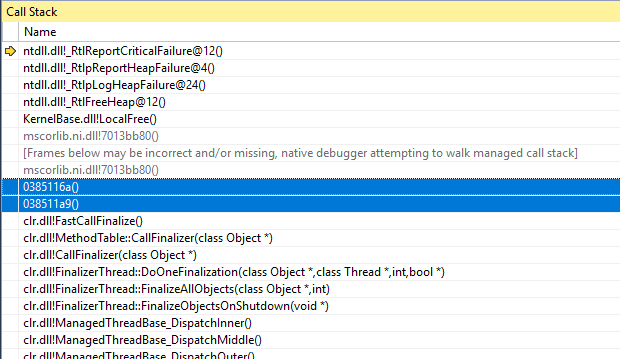 c0000005 Exception in C:\Windows\Microsoft.NET\Framework\v4.0.30319\sos.Threads debugger extension. We know that thread number 5 is the finalizer thread and we see that it is indeed calling into Event.Finalize where our exception happens. 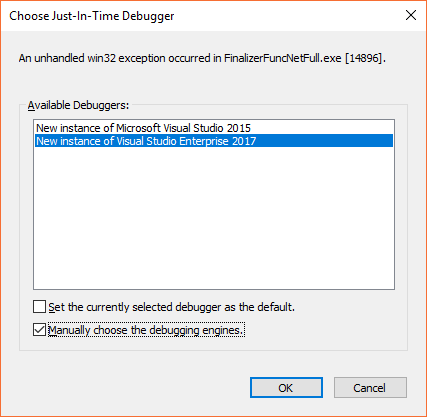 So far we did not get more information than we could get from the much easier to use Visual Studio debugger. Now lets check on which event object the finalizer was called. For that we can use a heuristic command named !dso which is the short form of Dump Stack Objects. to get a much less cluttered output. This extension is pure gold because it allows you to write LINQ style debugger queries to e.g. dump all object instances which derive from a common base class. It has extended support for WCF connections, sockets and APS.NET specific things. Found 4 unique roots (run '!GCRoot -all' to see all roots). This dump has no SOSEX heap index. The heap index makes searching for references and roots much faster. The problem with that approach is that there is an inherent race condition where a not yet completed Dispose call is calling into unmanaged code then the finalizer will try to call the unmanaged cleanup call a second time. There are several ways to get around that. The easiest is to move the GC.SuppressFinalize call before the Dispose call which will prevent the finalizer from running during shutdown if a Dispose call is already executing. If an exception escapes from the Dispose call it will not be tried by the finalizer a second time which sounds like a good deal for most resources. .NET Core on the other hand does not suffer from that issue because a .NET Core application has no final finalizer call which prevents that race condition entirely. Now go and check your finalizers to make your application correctly shutting down. /// are managed by the SafeNativeMemoryHandle which is the only class which needs a finalizer. You can also create event hierarchies by making the Dispose method virtual without fear to leak any handles from its derived classes. Each class which contains unmanaged resources should contain its own self cleaning members and you are done as long as there are no dependencies between them. I believe purely calling SuppressFinalize inside Dispose() is not the correct approach if we have a finalizer. In this case, one should follow the Dispose(bool) pattern instead and call Dispose(false) from the finalizer & Dispose(true) from the regular, parameterless Dispose(). That way, Dispose() can decide whether to call SuppressFinalize or not – based on the flag, as it makes no sense to call it from the finalizer itself. I find it to be a better alternative, what is your opinion about this? Hi Tamas the call inside Dispose() is there to keep the code example small. Calling it more than once will not hurt but from a clean code perspective it should only be called while the object is actually disposed. Yes you are right that the example is not clean in this regard but it will crash anyway. It is therefore a good bad example. But seriously, this whole topic of disposing taking into account finalizers, native handles, SafeHandles, critical finalizers, multi-threading, complex type hierarchies, appdomain unloads, application shutdown etc has caused so much headache for us, developers already. It is one of the toughest problems to solve correctly in my opinion. I would really-really love to see a solution in the infrastructure itself, so that we can stop fixing our code here and there. But that’s easier said than done I guess. Hi Alois! Great article and great blog. I’m glad I found it. I understand your reply to Tamas, but you could help new devs by fully implementing a proper Dispose(bool isDisposing) pattern. Anyway, like I said, great article! To be clear, the bug example is great, but the full pattern would be a better fix for new devs to see. I have updated the article with a SafeEvent version which fixes the issue in an easy way.